The number of times you ate fried clams exceeded the number of times you wore shoes or underwear. Getting another wine spritzer felt like a valid workout. You temporarily forgot your email password. Make and assemble the evening before to have a turn-key party salad. 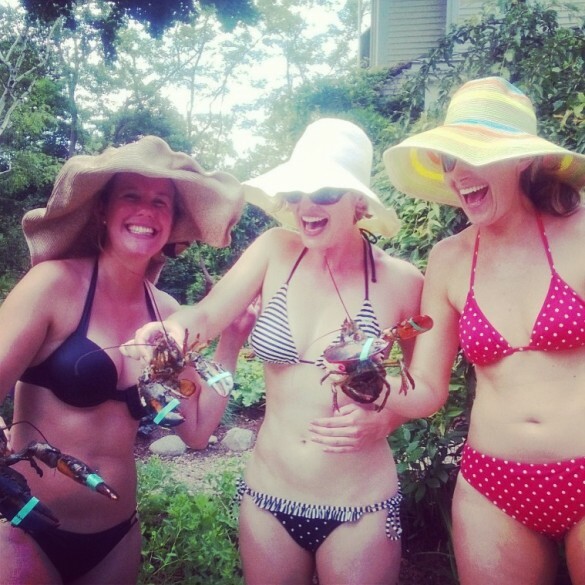 Such was the last week in sweet Ipswich, my own little paradise escape where good friends come for delicious grub, lots of love, and big laughs. The week kicked off getting ready for a big festive garden party my mom was throwing. We wanted glamorous food that could be totally prepared ahead and would fill people up without being too heavy. 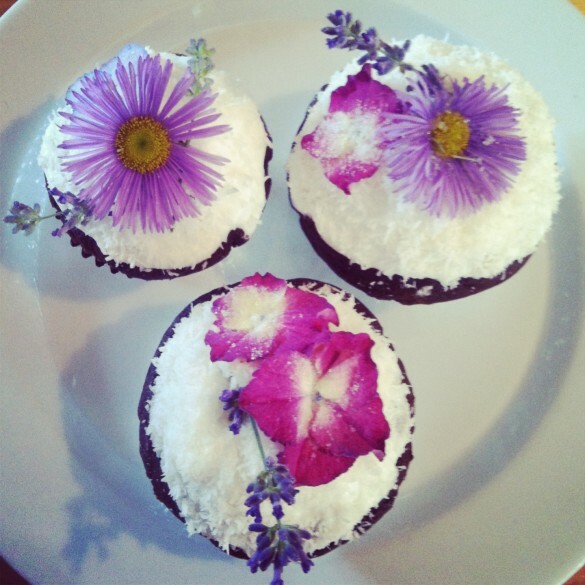 Party guests were invited to bring Cupcakes for dessert…decorated with a Garden Theme, bien sur! This Summer Penne Pasta Alfredo with Grilled Chicken, Walnuts, and Grapes is absolutely spectacular and couldn’t be easier. Prepared the night before you simply need to let it come to room temperature to have a beautiful salad that will dazzle a crowd. 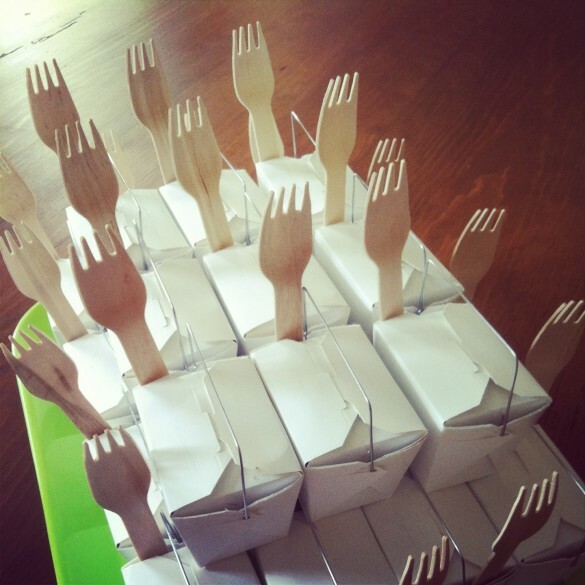 Served in individual Chinese takeout boxes with bamboo forks this was assembled the evening before and then trays brought out as people quickly gobbled it up. A guaranteed crowd pleaser. This recipe is very forgiving and doubles or triples beautifully so have fun experimenting with whatever appeals and is in your fridge or freezer. If the gorgonzola isn’t your style, skip it and instead consider sun-dried tomatoes and artichoke hearts perhaps. 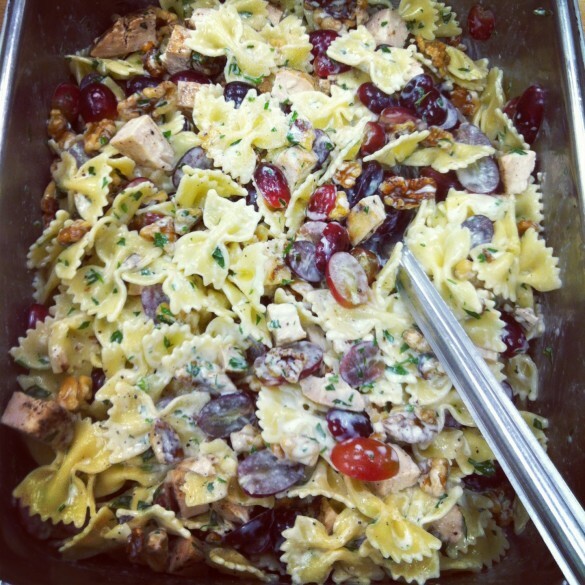 Summer Penne Pasta Alfredo with Grilled Chicken, Walnuts, and Grapes. Pictured here with bow ties, but we did a batch with penne as well, which I think worked better. Add the heavy cream and let it reduce by half. Turn heat to low and add the gorgonzola, stirring until fully incorporated. Toss the warm cream sauce with the warm pasta until fully coated (if you want something lighter you can toss a bit of the cooking water in as well). Mix in the chicken, walnuts, and grapes and season to taste with salt and pepper once more. Serve immediately or if making ahead be sure to allow ample time for it to fully come to room temperature. At least an hour or so. The pasta looks great for entertaining! Thank you! I love party food that is elegant, easy, and most importantly can be made ahead! SO fun seeing you bathing beauties by the pool! it was great having you home- do it more often! Hahaha…I just wasn’t quick enough to snap a picture of your (beautiful!) cupcakes before they all got gobbled up! So lovely to have the time at home with you all…thank you for being such fabulous neighbors! Great presentation! This looks wonderful! Fun recipe, fun post – thanks so much. Thank you John! Glad you enjoyed. What a beautiful vacation, complete with beautiful pasta. I love alfredo of any kind, but grapes and nuts sound like a delicious addition. Oh my. All looks fabulous. But the best part was that it looked like such fun!